If you’ve ever had beer-can chicken, you know how moist and delicious it is on the inside, and how delightfully crispy it is on the outside. Whether or not you’re familiar with this deceptively easy way to prepare a bird, there’s still much can you probably don’t know about beer-can chicken. We’ve compiled some interesting tidbits about this amazing creation, as well as some helpful tips and advice for making your next beer-infused bird better than ever. First though, for the uninitiated, here’s a run-down of how basic beer-can chicken preparation works. To start, turn on or light your grill to medium heat. Push the coals away from the center or turn off the middle burners so you can cook the chicken over indirect heat. Then select a can of your favorite beer. If you don’t have a preference, we suggest you choose a lager. Pop it open and drink or pour off about half of its contents while you prep the bird. To ready the chicken for cooking, remove and discard the giblets and neck before rinsing the bird inside and out and patting it dry with paper towels. Then, coat the chicken inside and out, first with olive oil, then with a spice rub like our Beer-Can Chicken Rub. Set the half-full beer can on your work-prep surface and pick the chicken up by its sides. With the rear-end of the bird facing down, lower the open cavity of the chicken onto the can. It should rest there without falling over. Tip: If you’re worried that your chicken won’t remain upright while cooking, you can buy a special can holder made specifically for this purpose. You can choose an entry-level model or one with a few bells and whistles. Once your chicken is ready to go, place it on the center of the grill and close the lid. Cook for approximately 1 1/4 hours, or until the internal temperature registers 165°F in the breast and 180°F in the thigh. After cooking, let the bird rest for ten minutes before digging into the tender, juicy deliciousness. Why Does Beer-Can Chicken Taste So Delicious? So, there you have it. And it really is just that simple. What is it about the beer can that transforms an ordinary chicken into a mouthwatering masterpiece? What’s at work here is steam, infusing the meat inside the bird with moist heat. (This keeps the chicken from drying out, and while it will result in a subtle beer flavor, you won’t get a buzz from eating the bird.) Meanwhile, the outside of the bird roasts to crispy golden perfection. But we still have some tips and ideas for making the chicken extra-delicious. First, you should know that don’t need to cook it on the grill. An oven heated to 375°F will do the job just as well. Also, beer isn’t your only option! You can use your favorite soft drink, such as cola or root beer if you prefer. You can get even more creative with an empty, clean aluminum can. Fill it halfway with chicken stock, wine, or any mix of liquid and herbs and spices. 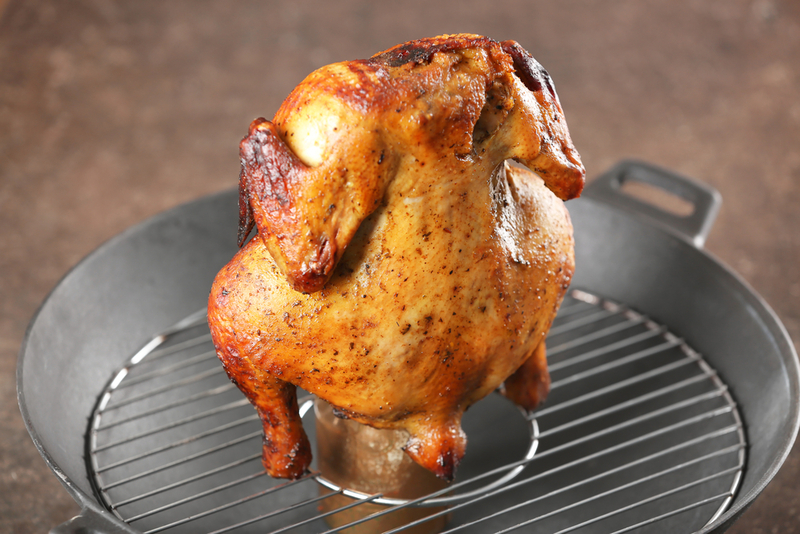 You might try also try using a combination of a healthy scoop of our Beer-Can Chicken Rub and a bit of water or wine, which will enhance the flavor of the rub you’ve already put on the bird’s flesh. Experiment and you’ll find there are myriad opportunities for creative cooking with a can and a chicken. Be sure your can doesn’t contain any traces of plastic (some stouts, such as Guinness, have a small plastic ball—known as a widget—inside that helps release the CO2 from the beer, so it won’t be a good choice for your beer-can chicken recipe). Removing the can from the cooked chicken can be tricky to master, so be sure to take care and work slowly when removing it so that you don’t burn yourself. Using a can holder apparatus like the highly rated ones we suggest above can help make this step easier to manage. Some suggest you poke additional holes in the top of the beer can, or even cut off the entire top. Try it and see if it improves the flavor or enhances the juiciness. Others recommend working some of the rub UNDER the skin as well as on top, and we even found that some folks like to insert thin slices of limes under the skin as well. Again, there are so many possibilities for creating new flavor combinations. With so many ways to cook beer-can chicken, you might find yourself drinking more beer and having more gatherings, just so you can try new variations of beer-can chicken (and when is that ever a bad thing?!). No matter what though, we suggest starting with our basic method, and, of course, using our tasty, flavorful rub! From there, the sky’s the limit! How do you prepare beer-can chicken? Share your recipes and tips with us by using the form below!